Since I talked about beets a few days ago, I wanted to share a versatile recipe that can be adapted for different types of meals. To make this recipe, you will need a Spiralizing tool of some kind. If you’re using a hand crank style, it may not work properly since beets are quite firm. If you have one that attaches to your counter, you should be able to make these beets without a problem. I shopped around quite a bit when I bought my spiralizer, and I decided on the Spirooli because it attached to the counter using suction cups, was very inexpensive, and worked really well with pretty much any food I tried to crank through it. If you’re wondering, I paid $14.99 for it at Bed Bath and Beyond (with the 20% of coupon the store offers). I looked at fancier versions and hand crank styles, but if this one gets the job done, why pay tons more? There are lots of other models on the market, so feel free to shop around and find one that works for your personal needs. Back to the beets. This recipe works for any color beet, so choose the ones that appeal to you the most. My husband and I like the golden and chioggia beets the most. Sometimes we will do all golden, all chioggia, or a combination of the two colors. The colors are rich and beautiful! When I cook beets this way, I take the tops and both ends off. Then I peel them. I spiralize my beets and add them to a pan on my stove top. They only take 8-10 minutes to cook, so this recipe is not long or complicated. 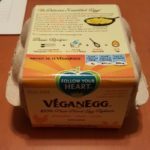 The idea is that these replace your pasta or other high carbohydrate starch. This gives you less carbs, more veggies in your diet, and more nutrients in the meal. The noodles are long so you can twirl them on your fork like spaghetti. You can add a protein of your choice to these noodles and even more vegetables! 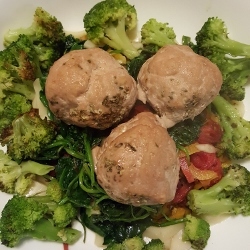 For example, I might do turkey meatballs with beet noodles and roasted broccoli and spinach (this picture to the right is that meal). 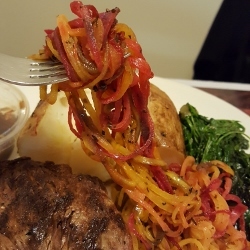 The meal is nutritious, colorful, and flavorful! Last week I made golden beet noodles with breaded chicken and french cut green beans. Once you start trying veggie noodles, you’ll be hooked! 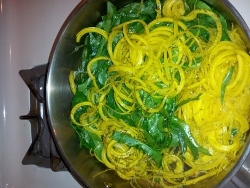 The picture below is golden beet noodles mixed with collard green ribbons. Colorful, delicious and packed with nutrients! Cut the root end of your beets. Then cut off the ‘tail’ end. Peel your beets using a traditional peeler or you can use your knife to carefully slice off the exterior skin. Consider wearing gloves if using red beets; they get pretty messy sometimes and can stain. Have a sauté pan or deep frying pan ready to go on your stove top. Pour 1-2 Tbsp of oil into it and set aside for cooking in a few minutes. Place each beet in your spiralizing tool, one at a time. If you’re using a hand crank style, it may not work properly since beets are quite firm. Spiralize your beets, catching them in a bowl as you go. When the bowl is full, pour the beet spirals into your pan on the stove. Repeat this process until all the beets are made into noodles. You can use cooking shears to trim the beets if they are getting way too long. Add your spices and onion if you’re using it. Use tongs to move the noodles around to help get the spices spread out in the dish. Add your remaining oil over the top of the beets. Cook over a medium flame for 8-10 minutes, checking it frequently to see if the beets are starting to wilt and get much softer. Be sure to stir them and move them around with your tongs so they cook evenly. You will see your beets go from firm and piled high to soft and smaller in the pan as they cook. Don’t worry if you see some darkening of lighter colored beets here; that is normal. When they are done, use your tongs to portion out noodles to each bowl. Top with your meat or protein of choice. You can use fresh garlic and herbs if you want. Just add a little extra of each and chop each one finely before putting in the frying pan. This sauté goes well with most proteins (chicken, beef, pork, tofu, etc.) and works really well as a substitute for pasta. Twirl your way to healthier eating! This is incredible. I love everything you have. I want to tryout everything! Love to be on your email list if possible. Thank you in advance. Beets are one of my favorite foods!! I hope I can be on your email list.